Rue is an ornamental plant with quite a weird smell. In fact, cats have utter disgust for Rue when they smell it. Therefore, if you don’t like having stray cats around, you might want to consider using Rue. However, for some other animals like caterpillars, feeding on Rue is essential for their development. In South India, it is also used to repel snakes. The essential oil produced by Rue has a very strong aroma just like the actual plant. It is totally distinct and easy to identify. It is quite bitter. Despite all these negative attributes, a lot of people are still using Rue Essential Oil because of all the benefits that they get from it. This includes treatment for cardiovascular and gastrointestinal problems. Some cosmetics companies also make use of Rue as an ingredient. You can find over 40 different species of Rue but not all of them are the same. Make sure that you research well on the kind of Rue that was used on the essential oil that you are buying as you might not get the exact effect that you wish to see. Ingestion of this essential oil is highly discouraged as it is poisonous. Even direct contact to the skin is not advisable unless it has been diluted with another substance. Rue is derived from the Greek word that literally translates “to regret bitterly.” Perhaps, it has something to do with the fact that you will regret it if you ingest the plant as it is poisonous. Even the Romans had discovered the benefits of refined Rue oil. It was even used as an abortifacient at that time. There were also some groups of people that made use of Rue for culinary purposes. Again, due to the fact that it is poisonous and bitter, it was not really easy to handle. It should be properly mixed with other ingredients and handled only be experts. Ethiopian cuisines usually feature Rue as an ingredient. 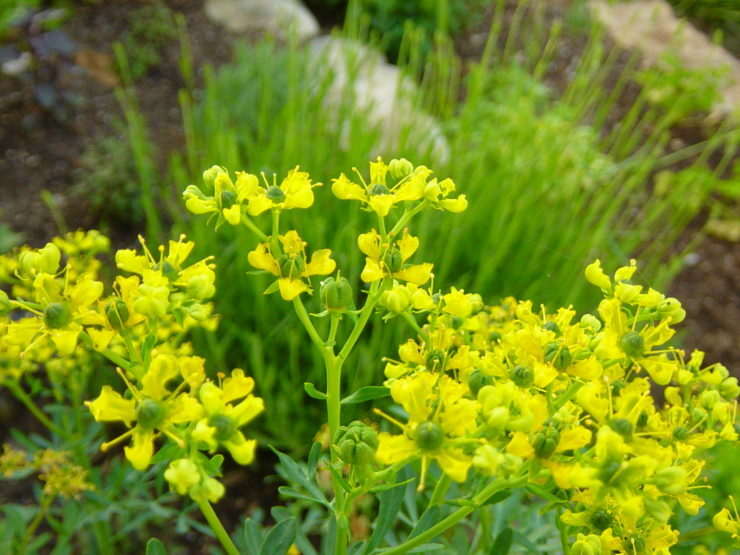 Rue has been used for quite some time especially as a cure to poisoning. However, Rue is also poisonous. Therefore, it is important to be very particular of the kind of essential oil that you buy. Make sure that you stick only with reliable stores and not buy something that has not been carefully processed. Ironically, it is also the poison present in Rue that makes it useful as a medicine for various illnesses. Prevents the growth of fungus in the body. Rue Essential Oil as Antidote. It is an effective antidote to poisoning especially for people who were bitten by cobra and other insects. It helps induce vomiting so that the poison will be eliminated from the system. Rue Essential Oil as Antifungal. It prevents the growth of fungus in the body. Therefore, it is perfect in fighting Athlete’s foot and dermatitis. Rue Essential Oil as Anti-hysteric. People suffering from hysteria are difficult to calm down. This essential oil helps calm the nerves and make them feel relaxed. It can also counter epilepsy and occasional fainting. Rue Essential Oil as Anti-rheumatism. The essential oil has the ability to relieve the body from pains including muscle and joint pains. Hence, people suffering from rheumatism may also find relief with the help of the essential oil. Rue Essential Oil as Insect Repellant. Most insects and even some animals like cats don’t like the smell of Rue. Therefore, if you want to keep these insects away, you can apply the essential oil to your skin. Rue Essential Oil as Relief from Indigestion. It ensures the better flow of digestion in the body and prevents indigestion from getting worse. This can also be used to fight other digestive problems. Rue Essential Oil as Treatment for Hair Loss. In some cases, you may also use it to prevent hair loss. Just make sure you blend it well with other essential oils so that it won’t be too strong on your scalp and prevent irritation. Rue Essential Oil as Cure for Itching Skin. It might not have the ability to fight skin problems, but it can prevent itching and allergies from getting worse. It can easily fight the cause of the allergies. Since Rue is poisonous, its essential oil may also be poisonous especially when used in large quantities. This is why you have to handle it with extreme care. It must not be taken internally unlike other essential oils even in small amounts. When using it, you must use gloves as you are not supposed to have direct contact with pure essential oil on your skin. Overdose may lead to skin irritation or even death. It is also known as an abortifacient. It means that pregnant women must not come any closer to this essential oil or else it would result to accidental abortions. Even breastfeeding women are not advised to use this essential oil. The best way to use this essential oil is topical. You are not allowed to inhale it directly as it is poisonous. It is also not advised to infest it even in small quantities as it could be detrimental to the body. It might even lead to death. Even if it is fine to apply it directly to the skin, it is advised not to use it as pure Rue Essential Oil. You have to mix it with other essential oils to counter its strong aroma. Lavender, citrus, frankincense and geranium are some of the best options. Use gloves when mixing the essential oils to avoid skin irritation. Rue is an herb native to the Balkan Peninsula. It has woody branches and blue or green leaves. It usually blooms during the summer. The flower is the part used in making the essential oil. It is a 4-petaled yellow flower that can be used as an antidote for poison. To extract the oil, it has to go through steam distillation just like any other essential oil. However, since it is highly toxic, you need to be careful with the entire process. In fact, it is advised not to make the essential oil at home as you might not go through the right process. Besides, the entire plant is also poisonous. It would be difficult for you to finish the entire steps. Always remember that you cannot use the essential oil directly to your skin unless you blend it with other essential oils. It is advised that you blend it with fennel, chamomile, frankincense and wormwood. You can add just 5 drops of Rue Essential Oil since it is quite strong with 5 drops of any other essential oil of your choice. You must follow the 1:1 ratio. This balances out the strength of Rue. You can buy this essential oil online through sites like Hermitage Oil. Just make sure you find one that is 100% Rue Essential Oil to maximize its benefits. You can also try local stores available near you, but this is quite hard to find. Even if it is poisonous, small amounts could actually be useful in manufacturing cosmetics and perfumes. People suffering from fainting and epilepsy could easily find relief with this essential oil as it has really strong smell. In Ethiopia, Rue leaves and berries are used for various cuisines. This is despite the fact that it is considered poisonous. Even in the past, it has been used for culinary purposes. Greece and other Mediterranean countries make use of it as a traditional flavoring. This is also tRue for some parts of Croatia and Northern Italy. Even its seeds can be used for making porridge. If there are a lot of insects at home, just use the essential oil to repel them. Rue is also referred to as the herb of grace or the mother of all herbs considering its power and strength.